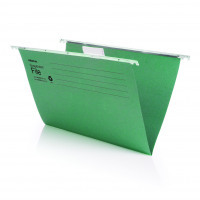 Initiative Suspension File With Tabs and Inserts Foolscap 215gsm Pack 50 Recycled - Norwich Office Supplies - Office Stationery and Furniture for Norfolk with Delivery to all of the UK. Get all your Computer Supplies, Print Consumables, Presentation Equipment, Paper, Desking & Seating Right Here! • For use with initiative filing cabinets. • Supplied complete with tabs and inserts. • 215 Gsm Green Manilla. Quality files. Perfect for everyday filing.